“Timely delivery and quality of service.” That’s what we’ve been promising since 1997. Smith Plastering, Inc. is a family owned and operated business. We started this company with the customer in mind. We have three generations of construction experience behind us preparing us for each and every job. We specialize in all aspects of stucco, drywall, painting and metal framing. Our company has built long standing professional relationships with the majority of the premier builders in Collier and Lee counties. We have a formidable reputation due to our concentration on superior quality and exceptional customer service. We pride ourselves in our professionalism, experienced employees and quality control that ensures our customers will be 100% satisfied. There aren’t many places that guarantee anything, but we’re so proud of what we can do that we guarantee your satisfaction with our quality craftsmanship. We’re done when the job is done. 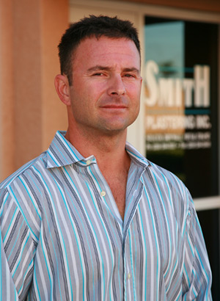 At Smith Plastering, Inc. our team of knowledgeable experts aim to please. With years of experience behind us we’re sure to have the solutions to all of your projects. We can accommodate the largest commercial builds to creating the perfect basement. Regardless of the size, you be confident that we will treat you and your project as if it is out only project. You will get the dedicated service you deserve. As President of Smith Plastering, Inc., I personally guarantee 100% customer satisfaction. I am always available to address any questions or concerns either by phone or in person.